This annex describes specifications for recommended defaults for the use of Unicode in the definitions of identifiers and in pattern-based syntax. It also supplies guidelines for use of normalization with identifiers. This document has been reviewed by Unicode members and other interested parties, and has been approved for publication by the Unicode Consortium. This is a stable document and may be used as reference material or cited as a normative reference by other specifications. A Unicode Standard Annex (UAX) forms an integral part of the Unicode Standard, but is published online as a separate document. The Unicode Standard may require conformance to normative content in a Unicode Standard Annex, if so specified in the Conformance chapter of that version of the Unicode Standard. The version number of a UAX document corresponds to the version of the Unicode Standard of which it forms a part. Please submit corrigenda and other comments with the online reporting form [Feedback]. Related information that is useful in understanding this annex is found in Unicode Standard Annex #41, “Common References for Unicode Standard Annexes.” For the latest version of the Unicode Standard, see [Unicode]. For a list of current Unicode Technical Reports, see [Reports]. For more information about versions of the Unicode Standard, see [Versions]. For any errata which may apply to this annex, see [Errata]. A common task facing an implementer of the Unicode Standard is the provision of a parsing and/or lexing engine for identifiers, such as programming language variables or domain names. To assist in the standard treatment of identifiers in Unicode character-based parsers and lexical analyzers, a set of specifications is provided here as a recommended default for the definition of identifier syntax. These guidelines follow the typical pattern of identifier syntax rules in common programming languages, by defining an ID_Start class and an ID_Continue class and using a simple BNF rule for identifiers based on those classes; however, the composition of those classes is more complex and contains additional types of characters, due to the universal scope of the Unicode Standard. This annex also provides guidelines for the user of normalization and case insensitivity with identifiers, expanding on a section that was originally in Unicode Standard Annex #15, “Unicode Normalization Forms” [UAX15]. The specification in this annex provides a definition of identifiers that is guaranteed to be backward compatible with each successive release of Unicode, but also allows any appropriate new Unicode characters to become available in identifiers. In addition, Unicode character properties for stable pattern syntax are provided. The resulting pattern syntax is backward compatible and forward compatible over future versions of the Unicode Standard. These properties can either be used alone or in conjunction with the identifier characters. The set consisting of the union of ID_Start and ID_Nonstart characters is known as Identifier Characters and has the property ID_Continue. The ID_Nonstart set is defined as the set difference ID_Continue minus ID_Start: it is not a formal Unicode property. While lexical rules are traditionally expressed in terms of the latter, the discussion here is simplified by referring to disjoint categories. Identifier characters, Pattern_Syntax characters, and Pattern_White_Space are disjoint: they will never overlap. The Identifier characters are always a superset of the ID_Start characters. The Pattern_Syntax characters and Pattern_White_Space characters are immutable and will not change over successive versions of Unicode. The ID_Start and ID_Nonstart characters may grow over time, either by the addition of new characters provided in a future version of Unicode or (in rare cases) by the addition of characters that were in Other. In successive versions of Unicode, the only allowed changes of characters from one of the above classes to another are those listed with a plus sign (+) in Table 1. The Unicode Consortium has formally adopted a stability policy on identifiers. For more information, see [Stability]. Programming Languages. Each programming language standard has its own identifier syntax; different programming languages have different conventions for the use of certain characters such as $, @, #, and _ in identifiers. To extend such a syntax to cover the full behavior of a Unicode implementation, implementers may combine those specific rules with the syntax and properties provided here. Each programming language can define its identifier syntax as relative to the Unicode identifier syntax, such as saying that identifiers are defined by the Unicode properties, with the addition of “$”. By addition or subtraction of a small set of language specific characters, a programming language standard can easily track a growing repertoire of Unicode characters in a compatible way. See also Section 2.5, Backward Compatibility. Similarly, each programming language can define its own whitespace characters or syntax characters relative to the Unicode Pattern_White_Space or Pattern_Syntax characters, with some specified set of additions or subtractions. Systems that want to extend identifiers to encompass words used in natural languages, or narrow identifiers for security may do so as described in Section 2.3, Layout and Format Control Characters, Section 2.4, Specific Character Adjustments, and Section 5, Normalization and Case. To preserve the disjoint nature of the categories illustrated in Figure 1, any character added to one of the categories must be subtracted from the others. Note: In many cases there are important security implications that may require additional constraints on identifiers. For more information, see [UTR36]. The following describes the possible ways that an implementation can claim conformance to this specification. UAX31-C1. An implementation claiming conformance to this specification at any Level shall identify the version of this specification and the version of the Unicode Standard. The formal syntax provided here captures the general intent that an identifier consists of a string of characters beginning with a letter or an ideograph, and followed by any number of letters, ideographs, digits, or underscores. It provides a definition of identifiers that is guaranteed to be backward compatible with each successive release of Unicode, but also adds any appropriate new Unicode characters. Identifiers are defined by the sets of lexical classes defined as properties in the Unicode Character Database. These properties are shown in Table 2. ID_Start XID_Start Characters having the Unicode General_Category of uppercase letters (Lu), lowercase letters (Ll), titlecase letters (Lt), modifier letters (Lm), other letters (Lo), letter numbers (Nl), minus Pattern_Syntax and Pattern_White_Space code points, plus stability extensions. Note that “other letters” includes ideographs. In set notation, this is [[:L:][:Nl:]--[:Pattern_Syntax:]--[:Pattern_White_Space:]] plus stability extensions. ID_Continue XID_Continue All of the above, plus characters having the Unicode General_Category of nonspacing marks (Mn), spacing combining marks (Mc), decimal number (Nd), connector punctuations (Pc), plus stability extensions, minus Pattern_Syntax and Pattern_White_Space code points. In set notation, this is [[:L:][:Nl:][:Mn:][:Mc:][:Nd:][:Pc:]--[:Pattern_Syntax:]--[:Pattern_White_Space:]] plus stability extensions. These are also known simply as Identifier Characters, because they are a superset of the ID_Start characters. Incorporation of proper handling of combining marks. Allowance for layout and format control characters, which should be ignored when parsing identifiers. The XID_Start and XID_Continue properties are improved lexical classes that incorporate the changes described in Section 5.1, NFKC Modifications. They are recommended for most purposes, especially for security, over the original ID_Start and ID_Continue properties. Combining marks are accounted for in identifier syntax: a composed character sequence consisting of a base character followed by any number of combining marks is valid in an identifier. Combining marks are required in the representation of many languages, and the conformance rules in Chapter 3, Conformance, of [Unicode] require the interpretation of canonical-equivalent character sequences. The simplest way to do this is to require identifiers in the NFC format (or transform them into that format); see Section 5, Normalization and Case. Enclosing combining marks (such as U+20DD..U+20E0) are excluded from the definition of the lexical class ID_Continue, because the composite characters that result from their composition with letters are themselves not normally considered valid constituents of these identifiers. Modifier letters (General_Category=Lm) are also included in the definition of the syntax classes for identifiers. Modifier letters are often part of natural language orthographies and are useful for making word-like identifiers in formal languages. On the other hand, modifier symbols (General_Category=Sk), which are seldom a part of language orthographies, are excluded from identifiers. For more discussion of modifier letters and how they function, see [Unicode]. Implementations that tailor identifier syntax for special purposes may wish to take special note of modifier letters, as in some cases modifier letters have appearances, such as raised commas, which may be confused with common syntax characters such as quotation marks. Certain Unicode characters are known as Default_Ignorable_Code_Points. These include variation selectors and control-like characters used to control joining behavior, bidirectional ordering control, and alternative formats for display (having the General_Category value of Cf). The recommendation is to permit them in identifiers only in special cases, listed below. The use of default-ignorable characters in identifiers is problematical because the effects they represent are normally just stylistic or otherwise out of scope for identifiers. It is also possible to misapply these characters such that users can create strings that look the same but actually contain different characters, which can create security problems. In such environments, identifiers should also be limited to characters that are case-folded and normalized with the NFKC_CaseFold operation. For more information, see Section 5, Normalization and Case and UTR# 36: Unicode Security Considerations [UTR36]. For the above reasons, default-ignorable characters are normally excluded from Unicode identifiers. However, visible distinctions created by certain format characters (particularly the Join_Control characters) are necessary in certain languages. A blanket exclusion of these characters makes it impossible to create identifiers with the correct visual appearance for common words or phrases in those languages. Identifier systems that attempt to provide more natural representations of terms in modern, customary use should allow these characters in input and display, but limit them to contexts in which they are necessary. The term modern customary usage includes characters that are in common use in newspapers, journals, lay publications; on street signs; in commercial signage; and as part of common geographic names and company names, and so on. It does not include technical or academic usage such as in mathematical expressions, using archaic scripts or words, or pedagogical use (such as illustration of half-forms or joining forms in isolation), or liturgical use. Thus in such circumstances, an implementation should allow the following Join_Control characters in the limited contexts specified in A1, A2, and B below. While these restrictions greatly limit visual confusability, they do not prevent it. For example, because Tamil only uses a Join_Control character in one specific case, most of the sequences these rules allow in Tamil are, in fact, visually confusable. Therefore based on their knowledge of the script concerned, implementations may choose to have tighter restrictions than specified below. There are also cases where a joiner preceding a virama makes a visual distinction in some scripts. It is currently unclear whether this distinction is important enough in identifiers to warrant retention of a joiner. For more information, see UTR# 36: Unicode Security Considerations [UTR36]. Performance. Parsing identifiers can be a performance-sensitive task. However, these characters are quite rare in practice, thus the regular expressions (or equivalent processing) only rarely would need to be invoked. Thus these tests should not add any significant performance cost overall. Comparison. Typically the identifiers with and without these characters should compare as equivalent, to prevent security issues. See Section 2.4, Specific Character Adjustments. Script Restriction. In each of the following cases, the specified sequence must only consist of characters from a single script (after ignoring Common and Inherited script characters). 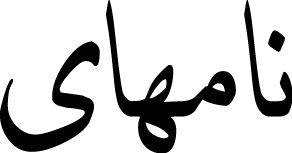 For example, consider Farsi <Noon, Alef, Meem, Heh, Alef, Farsi Yeh>. Without a ZWNJ, it translates to "names", as shown in the first row; with a ZWNJ between Heh and Alef, it means "a letter", as shown in the second row of Figure 2. For example, the Malayalam word for eyewitness is shown in Figure 3. The form without the ZWNJ in the second row is incorrect in this case. For example, the Sinhala word for the country 'Sri Lanka' is shown in the first row of Figure 4, which uses both a space character and a ZWJ. Removing the space results in the text shown in the second row of Figure 4, which is still legible, but removing the ZWJ completely modifies the appearance of the 'Sri' cluster and results in the unacceptable text appearance shown in the third row of Figure 4. Specific identifier syntaxes can be treated as tailorings (or profiles) of the generic syntax based on character properties. For example, SQL identifiers allow an underscore as an identifier continue, but not as an identifier start; C identifiers allow an underscore as either an identifier continue or an identifier start. Specific languages may also want to exclude the characters that have a Decomposition_Type other than Canonical or None, or to exclude some subset of those, such as those with a Decomposition_Type equal to Font. There are circumstances in which identifiers are expected to more fully encompass words or phrases used in natural languages. In these cases, a profile should consider whether the characters in Table 3 should be allowed in identifiers, and perhaps others, depending on the languages in question. In some environments even spaces are allowed in identifiers, such as in SQL: SELECT * FROM Employee Pension. The characters marked with an asterisk in Table 3 are Join_Control characters, discussed in Section 2.3, Layout and Format Control Characters. In identifiers that allow for unnormalized characters, the compatibility equivalents of the characters listed in Table 3 may also be appropriate. For more information on characters that may occur in words, and those that may be used in name validation, see Section 4, Word Boundaries, in [UAX29]. Some characters are not in modern customary use, and thus implementations may want to exclude them from identifiers. These include characters in historic and obsolete scripts, scripts used mostly liturgically, and regional scripts used only in very small communities or with very limited current usage. The set of characters in Table 4, Candidate Characters for Exclusion from Identifiers provides candidates of these, plus some inappropriate technical blocks. The scripts listed in Table 5a, Recommended Scripts are generally recommended for use in identifiers. These are in widespread modern customary use, or are regional scripts in modern customary use by large communities. Those in the subtable marked "Aspirational Use" are scripts would otherwise qualify as Limited Use (see Table 5b, Limited Use Scripts), but have strong current efforts to increase their usage. Modern scripts that are in more limited use are listed in Table 5b, Limited Use Scripts. To avoid security issues, some implementations may wish to disallow the limited-use scripts in identifiers. For more information on usage, see the Unicode Locale project [CLDR]. This is the recommendation as of the current version of Unicode; as new scripts are added to future versions of Unicode, characters may be added to Tables 4, 5a, and 5b. Characters may also be moved from one table to another as more information becomes available. There are a few special cases. The Common and Inherited script values [[:script=Zyyy:][:script=Zinh:]] are used widely with other scripts, rather than being scripts per se. The Unknown script [:script=Zzzz:] is used for Unassigned characters. Braille [:script=Brai:] consists only of symbols, and Katakana_Or_Hiragana [:script=Hrkt:] is empty (used historically in Unicode, but no longer.) With respect to the scripts Balinese, Cham, Ol Chiki, Vai, Kayah Li, and Saurashtra, there may be large communities of people speaking an associated language, but the script itself is not not in widespread use. However, there are significant revival efforts. Bopomofo is used primarily in education. For programming language identifiers, normalization and case have a number of important implications. For a discussion of these issues, see Section 5, Normalization and Case. The Other_ID_Start and Other_ID_Continue properties are thus designed to ensure that the Unicode identifier specification is backward compatible. Any sequence of characters that qualified as an identifier in some version of Unicode will continue to qualify as an identifier in future versions. If a specification tailors the Unicode recommendations for identifiers, then this technique can also be used to maintain backwards compatibility across versions. To meet this requirement, an implementation shall use definition D1 and the properties ID_Start and ID_Continue (or XID_Start and XID_Continue) to determine whether a string is an identifier. Alternatively, it shall declare that it uses a profile and define that profile with a precise specification of the characters that are added to or removed from the above properties and/or provide a list of additional constraints on identifiers. To meet this requirement, an implementation shall define a profile for R1 which allows format characters as described in Section 2.3, Layout and Format Control Characters. An implementation may further restrict the context for ZWJ or ZWNJ, such as by limiting the scripts, if a clear specification for such a further restriction is supplied. To meet this requirement, an implementation shall guarantee that identifiers are stable across versions of the Unicode Standard: that is, once a string qualifies as an identifier, it does so in all future versions. This is typically achieved by using grandfathered characters. The disadvantage of working with the lexical classes defined previously is the storage space needed for the detailed definitions, plus the fact that with each new version of the Unicode Standard new characters are added, which an existing parser would not be able to recognize. In other words, the recommendations based on that table are not upwardly compatible. This problem can be addressed by turning the question around. Instead of defining the set of code points that are allowed, define a small, fixed set of code points that are reserved for syntactic use and allow everything else (including unassigned code points) as part of an identifier. All parsers written to this specification would behave the same way for all versions of the Unicode Standard, because the classification of code points is fixed forever. The drawback of this method is that it allows “nonsense” to be part of identifiers because the concerns of lexical classification and of human intelligibility are separated. Human intelligibility can, however, be addressed by other means, such as usage guidelines that encourage a restriction to meaningful terms for identifiers. For an example of such guidelines, see the XML specification by the W3C, Version 1.0 5th Edition or later [XML]. By increasing the set of disallowed characters, a reasonably intuitive recommendation for identifiers can be achieved. This approach uses the full specification of identifier classes, as of a particular version of the Unicode Standard, and permanently disallows any characters not recommended in that version for inclusion in identifiers. All code points unassigned as of that version would be allowed in identifiers, so that any future additions to the standard would already be accounted for. This approach ensures both upwardly compatible identifier stability and a reasonable division of characters into those that do and do not make human sense as part of identifiers. With or without such fine-tuning, such a compromise approach still incurs the expense of implementing large lists of code points. While they no longer change over time, it is a matter of choice whether the benefit of enforcing somewhat word-like identifiers justifies their cost. Alternatively, one can use the properties described below and allow all sequences of characters to be identifiers that are neither Pattern_Syntax nor Pattern_White_Space. This has the advantage of simplicity and small tables, but allows many more “unnatural” identifiers. Alternatively, it shall declare that it uses a profile and define that profile with a precise specification of the characters that are added to or removed from the sets of code points defined by these properties. Plus all code points unassigned in Unicode 5.0 that do not have the property values specified in R2 Alternative Identifiers. This technique allows identifiers to have a more natural format—excluding symbols and punctuation already defined—yet also provides absolute code point immutability. Specifications should also include guidelines and recommendations for those creating new identifiers. Although R2 Alternative Identifiers permits a wide range of characters, as a best practice identifiers should be in the format NFKC, without using any unassigned characters. For more information on NFKC, see Unicode Standard Annex #15, “Unicode Normalization Forms” [UAX15]. There are many circumstances where software interprets patterns that are a mixture of literal characters, whitespace, and syntax characters. Examples include regular expressions, Java collation rules, Excel or ICU number formats, and many others. In the past, regular expressions and other formal languages have been forced to use clumsy combinations of ASCII characters for their syntax. As Unicode becomes ubiquitous, some of these will start to use non-ASCII characters for their syntax: first as more readable optional alternatives, then eventually as the standard syntax. With a fixed set of whitespace and syntax code points, a pattern language can then have a policy requiring all possible syntax characters (even ones currently unused) to be quoted if they are literals. Using this policy preserves the freedom to extend the syntax in the future by using those characters. Past patterns on future systems will always work; future patterns on past systems will signal an error instead of silently producing the wrong results. Consider the following scenario, for example. In version 1.0 of program X, '≈' is a reserved syntax character; that is, it does not perform an operation, and it needs to be quoted. In this example, '\' quotes the next character; that is, it causes it to be treated as a literal instead of a syntax character. In version 2.0 of program X, '≈' is given a real meaning—for example, “uppercase the subsequent characters”. The pattern abc...\≈...xyz works on both versions 1.0 and 2.0, and refers to the literal character because it is quoted in both cases. The pattern abc...≈...xyz works on version 2.0 and uppercases the following characters. On version 1.0, the engine (rightfully) has no idea what to do with ≈. Rather than silently fail (by ignoring ≈ or turning it into a literal), it has the opportunity to signal an error. As of [Unicode4.1], two Unicode character properties are defined to provide for stable syntax: Pattern_White_Space and Pattern_Syntax. Particular pattern languages may, of course, override these recommendations, for example, by adding or removing other characters for compatibility with ASCII usage. For stability, the values of these properties are absolutely invariant, not changing with successive versions of Unicode. Of course, this does not limit the ability of the Unicode Standard to encode more symbol or whitespace characters, but the syntax and whitespace code points recommended for use in patterns will not change. When generating rules or patterns, all whitespace and syntax code points that are to be literals require quoting, using whatever quoting mechanism is available. For readability, it is recommended practice to quote or escape all literal whitespace and default ignorable code points as well. To meet this requirement, an implementation shall use Pattern_White_Space characters as all and only those characters interpreted as whitespace in parsing, and shall use Pattern_Syntax characters as all and only those characters with syntactic use. All characters except those that have these properties are available for use as identifiers or literals. This section discusses issues that must be taken into account when considering normalization and case folding of identifiers in programming languages or scripting languages. Using normalization avoids many problems where apparently identical identifiers are not treated equivalently. Such problems can appear both during compilation and during linking—in particular across different programming languages. To avoid such problems, programming languages can normalize identifiers before storing or comparing them. Generally if the programming language has case-sensitive identifiers, then Normalization Form C is appropriate; whereas, if the programming language has case-insensitive identifiers, then Normalization Form KC is more appropriate. Implementations that take normalization and case into account have two choices: to treat variants as equivalent, or to disallow variants. To meet this requirement, an implementation shall specify the Normalization Form and shall provide a precise specification of the characters that are excluded from normalization, if any. If the Normalization Form is NFKC, the implementation shall apply the modifications in Section 5.1, NFKC Modifications, given by the properties XID_Start and XID_Continue. Except for identifiers containing excluded characters, any two identifiers that have the same Normalization Form shall be treated as equivalent by the implementation. To meet this requirement, an implementation shall specify either simple or full case folding, and adhere to the Unicode specification for that folding. Any two identifiers that have the same case-folded form shall be treated as equivalent by the implementation. To meet this requirement, an implementation shall specify the Normalization Form and shall provide a precise specification of the characters that are excluded from normalization, if any. If the Normalization Form is NFKC, the implementation shall apply the modifications in Section 5.1, NFKC Modifications, given by the properties XID_Start and XID_Continue. Except for identifiers containing excluded characters, allowed identifiers must be in the specified Normalization Form. To meet this requirement, an implementation shall specify either simple or full case folding, and adhere to the Unicode specification for that folding. Except for identifiers containing excluded characters, allowed identifiers must be in the specified Normalization Form. For R6, this involves disallowing any characters in the set [:NFKC_QuickCheck=No:] (or equivalently, disallowing [:^isNFKC:]). For R7 with full case folding, this involves disallowing any characters in the set [:^isCaseFolded:]. As of Unicode 5.2, an additional string transform is available for use in matching identifiers: toNFKC_Casefold. See R6 in Section 3.13, Default Case Algorithms in [Unicode]. That operation case folds and normalizes a string, and also removes default ignorable code points. It can be used to support an implementation of Equivalent Case and Compatibility-Insensitive Identifiers. There is a corresponding boolean property, Changes_When_NFKC_Casefolded, which can be used to support an implementation of Filtered Case and Compatibility-Insensitive Identifiers. The NFKC_Casefold character mapping property and the Changes_When_NFKC_Casefolded property are described in Unicode Standard Annex #44, "Unicode Character Database" [UAX44]. Note: In mathematically oriented programming languages that make distinctive use of the Mathematical Alphanumeric Symbols, such as U+1D400 MATHEMATICAL BOLD CAPITAL A, an application of NFKC must filter characters to exclude characters with the property value Decomposition_Type=Font. Where programming languages are using NFKC to fold differences between characters, they need the following modifications of the identifier syntax from the Unicode Standard to deal with the idiosyncrasies of a small number of characters. These modifications are reflected in the XID_Start and XID_Continue properties. Irregularly decomposing characters. U+037A GREEK YPOGEGRAMMENI and certain Arabic presentation forms have irregular compatibility decompositions and are excluded from both XID_Start and XID_Continue. It is recommended that all Arabic presentation forms be excluded from identifiers in any event, although only a few of them must be excluded for normalization to guarantee identifier closure. With these amendments to the identifier syntax, all identifiers are closed under all four Normalization Forms. This means that for any string S, the implications shown in Figure 5 hold. Identifiers are also closed under case operations. For any string S (with exceptions involving a single character), the implications shown in Figure 6 hold. The one exception for casing is U+0345 COMBINING GREEK YPOGEGRAMMENI. In the very unusual case that U+0345 is at the start of S, U+0345 is not in XID_Start, but its uppercase and case-folded versions are. In practice, this is not a problem because of the way normalization is used with identifiers. The reverse implication is not true in the case of compatibility equivalence: isIdentifier(toNFC(S)) does not imply isIdentifier(S). There are many characters for which the reverse implication is not true, because there are many characters counting as symbols or non-decimal numbers—and thus outside of identifiers—whose compatibility equivalents are letters or decimal numbers and thus in identifiers. Some examples are shown in Table 6. If an implementation needs to ensure both directions for compatibility equivalence of identifiers, then the identifier definition needs to be tailored to add these characters. For canonical equivalence the implication is true in both directions. isIdentifier(toNFC(S)) if and only if isIdentifier(S). There were two exceptions before Unicode 5.1, as shown in Table 7. If an implementation needs to ensure full canonical equivalence of identifiers, then the identifier definition must be tailored so that these characters have the same value, so that either both isIdentifier(S) and isIdentifier(toNFC(S)) are true, or so that both values are false. Those programming languages with case-insensitive identifiers should use the case foldings described in Section 3.13, Default Case Algorithms, of [Unicode] to produce a case-insensitive normalized form. When source text is parsed for identifiers, the folding of distinctions (using case mapping or NFKC) must be delayed until after parsing has located the identifiers. Thus such folding of distinctions should not be applied to string literals or to comments in program source text. The Unicode Standard supports case folding with normalization, with the function toNFKC_Casefold(X). See definition R6 in Section 3.13, Default Case Algorithms in [Unicode] for the specification of this function and further explanation of its use. Mark Davis is the author of the initial version and has added to and maintained the text of this annex. Thanks to Eric Muller, Asmus Freytag, Julie Allen, Kenneth Whistler, and Martin Duerst for feedback on this annex. For details of the change history, see the online copy of this annex at http://www.unicode.org/reports/tr31/. The following summarizes modifications from previous revisions of this annex. Corrected two code points in figure 2. Corrected 2 code points in figure 3. Updated format of figures 2, 3, 4 to use small images in tables instead of large images. Clarified text in Section 2.3 Layout and Format Control Characters. Split Table 5 into two Tables,Table 5a, Recommended Scripts and Table 5b, Limited Use Scripts. Added Brahmi, Mandaic, and Batak to Table 4, Candidate Characters for Exclusion from Identifiers and Table 5b, Limited Use Scripts. Replaced discussion of case folding with normalization by paragraph pointing to toNFKC_Casefold(X). Moved Syriac to Limited Use; qualified Tifinagh, Yi, UCAS, Mongolian as aspirational. Deleted misleading sentence about stability, and added underbar to ID_Nonstart. Added U+19DA to list of Other_ID_Continue characters in Section 2.5, Backward Compatibility. Revision 12 being a proposed update, only changes between revisions 13 and 11 are noted here. Added pointer to name validation in #29. Tightened the first two paragraphs in section 2.3 Layout and Format Control Characters, and the subsection on Comparison. Added clarification that the rules limit but do not prevent visual confusability. Moved scripts between Tables 4 and 5, and marked some as limited use. Added pointer to CLDR. Added note that there are also cases where a joiner is used in front of a virama. In A1. Allow ZWNJ in the following context, changed $L and $R to $LJ and $RJ respectively to disambiguate from $L meaning Letter; fixed property name to Joining_Type, and fixed the text to correspond correctly to the regex. Added HTML anchors to Figures and Tables. Added to Candidate Characters for Inclusion in Identifiers: U+0F0B ( ་ ) TIBETAN MARK INTERSYLLABIC TSHEG and U+30FB ( ・ ) KATAKANA MIDDLE DOT. Added to Candidate Characters for Exclusion from Identifiers or Recommended Scripts: Default Ignorable Code Points, Tatweel (-like) characters, and scripts Old Turkic, Old South Arabian, Imperial Aramaic, Inscriptional Parthian, Inscriptional Pahlavi, Avestan, Egyptian Hieroglyphs, Samaritan, Kaithi, Lisu, Meetei Mayek, Tai Tham, Tai Viet, Javanese, Bamum. Updated caption style for figures and tables. Added table captions and centered Tables 6 and 7 in Section 5.1. Split the unnumbered identifier closure table in Section 5.1 into two Figures and adjusted the surrounding text for clarity. Removed borders around images, and redrew Figures 2, 3, 4 for clarity. Updated explanatory text for Figure 4. Revision 10 being a proposed update, only changes between revisions 11 and 9 are noted here. Fixed Table 2 to exclude Pattern_Syntax and Pattern_White_Space explicitly. Removed surrogates, private-use, and control from R2, added notes. Noted restrictions on ZWJ/ZWNJ are as applied to NFC. Added Section 2.2 Modifier Letters and renumbered sections. Added Table 5, to show other scripts. Noted that both Tables will require updating with successive versions of Unicode, as new scripts are added. Broadened the discussion of Layout Controls to include other Default Ignorables in 2.3 Layout and Format Control Characters. Minor reformatting of tables and figures, and addition of captions to tables. Added descriptions of scripts in Table 4, Candidate Characters for Exclusion from Identifiers. Added sentence about further restrictions to R1a. Added line pointing to UTR36 for information about further restrictions. Added to discussion of canonical equivalence of identifiers. Added filtered identifiers and rules. Added format character discussion and rules. Revision 8 being a proposed update, only changes between revisions 9 and 7 are noted here. Revision 6 being a proposed update, only changes between revisions 7 and 5 are noted here. Removed section 4.1, because the two properties have been accepted for Unicode 4.1. Adding information about stability, and tailoring for identifiers. Added the list of characters in Other_ID_Continue . Changed <identifier_continue> and <identifier_start> to just use the property names, to avoid confusion. Included XID_Start and XID_Continue in R1 and elsewhere. Added reference to UTR #36, and the phrase “or a list of additional constraints on identifiers” to R1. Changed “Coverage” to “General Description of Coverage,” because the UCD value are definitive. Changed <identifier_extend> to <identifier_continue> to better match the property name. First version: incorporated section from Unicode 4.0 on Identifiers plus new section on patterns.